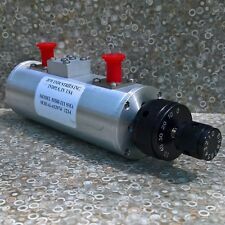 The RF Attenuator is NEW has never been used. SMA Female. Frequency Min Frequency Max Connector 2 Connector 1. Maximum Frequency: DC- 6GHz. Connector: SMA-JK. Attenuation: 1-30dB available, and 1-10dB. ±0.5dB,15-30dB±1dB. Frequency range: DC - 4.0GHz Maximum power: 23dBm (200mW). Direct: 0dB (reference) Level 1: 10 0.8 dB. RF interface: SMA double female head (Outer screw inner hole). Level 3: 30 1.5dB. Level 2: 20 1.1 dB. JFW Model #: 50DR-111 SMA. Attenuator Type: Manually variable attenuator. RF Input Power: 2 Watts. Frequency Start: 0 MHz (DC). HMC470 digital RF attenuator module DC-3GHz 1dB step to 31dB manual and programmable. 1 xHMC470 digital RF attenuator module DC-3GHz 1dB step to 31dB manual and programmable. 2, the maximum input power: 27dBm. JFW 50R-193; 0-10dB 1dB Stepping; DC-2.2GHz 50Ω; SMA connector. One Texscan RF Attenuator. Model LA-50. 5 µSec pulse, 0.05% duty cycle. Average power at 25°C derated linearly to 6.25 Watt at 85°C. Attenuation: 20dB. Connector: SMA. Impedance: 50Ω. JFW Model #: 50DR-001. Attenuator Type: Manually variable attenuator. Frequency Start: 0 MHz (DC). Frequency Stop: 1000 MHz. 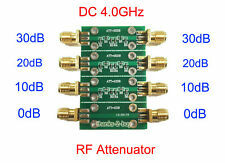 RF Attenuator 10dB ±0.5dB 0Hz ~ 6GHz 50 Ohms 2W SMA In-Line Module. Fast Dispatch Service. We're down to earth, easy to work with people. ARRA LINE ATTENUATOR RF MICROWAVE FREQUENCY 3-6844-10 NEW UNUSED. Used Untested Attic find Jerrold AV-75 RF Attennuator 75 Ohm. 2 BNC Connections. Included 1 75 Ohm Dummy Load. The one photographed was opened for picture purposes only. The one you receive will be sealed. Hours of Operation. Our 30,000 Sq.Ft. From long time collectors estate. Sold as is. Was told it works. Please see pictures for condition as they are part of description. Great graphics.